We offer 10 guestrooms and can accommodate up to 25 people. Some of our newer rooms are air conditioned. Should you require additional rooms, we can make arrangements to accommodate more guests. Our guest rooms feature full-size beds and each room has a private bathroom with a shower. We take pride in providing you with a clean and comfortable place to stay during your visit. 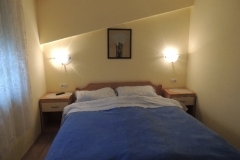 In addition, we offer as well in the neighboring village of Mance 14 beds in 4 rooms of Category 3 apples, with kitchenette, air conditioning and satellite TV and where it is also possible to rent an apartment for a larger group of guests. We accept orders of up to 60 people for various celebrations. Price for single-use is 5 € lower from prices listed above, which are valid for double room.